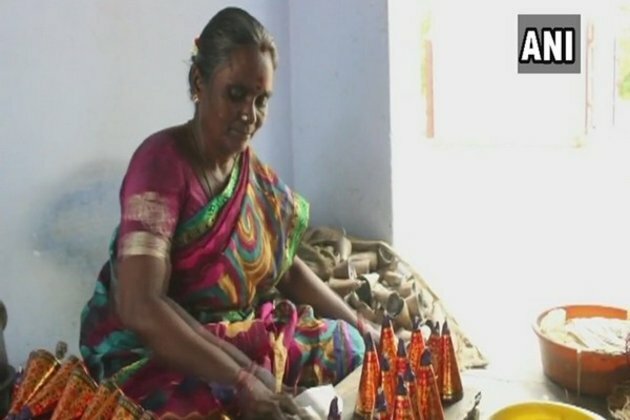 Sivakasi (Tamil Nadu) [India], Oct 14 (ANI): Despite onset of the festive season, Sony Fireworks, a firecracker company in Tamil Nadu's Sivakasi, is facing 'huge uncertainty' with regard to sales as there has been a big decline in the demand of firecrackers. "Livelihood of eight to 10 lakh people depends on this industry. Huge stock is lying unsold after last year's Supreme Court judgement on ban on sale and purchase of firecrackers in Delhi-NCR due to rising pollution levels. There is huge uncertainty," said Ganeshan, Director of Sony Fireworks. On October 9 last year, the apex court had imposed a blanket ban on the sale of firecrackers in Delhi-NCR in the run-up of Diwali to check the alarming pollution level. Not to forget, the air quality of Delhi has already started to deteriorate due to stubble burning in neighbouring states of Punjab and Haryana.